Making its entrance today is the 2013-W $50 American Gold Buffalo Proof Coin. The United States Mint released the 24-karat, 99.99% pure gold coin for $1,790.00. Don’t fixate on that price. It can change every Wednesday based on an average of London gold fixings. 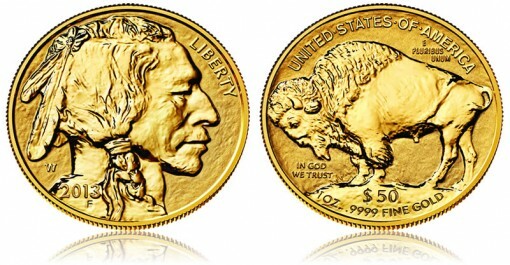 Actually, starting sales for the American Gold Buffalo could suffer as it just missed debuting $50 lower at $1,740.00. More than a few prospective buyers may wait on the sidelines, enjoy the extended holiday weekend, and hope for a price drop on Wednesday, May 29. 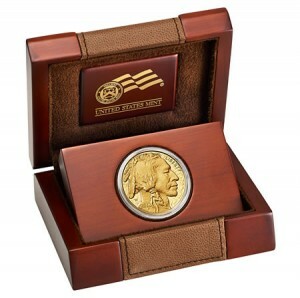 Released annually in bullion and proof formats since 2006, the one-ounce American Gold Buffalo features popular designs that are 100 years old. Prominent sculptor James Earle Fraser crafted them for the 1913 Buffalo nickel. 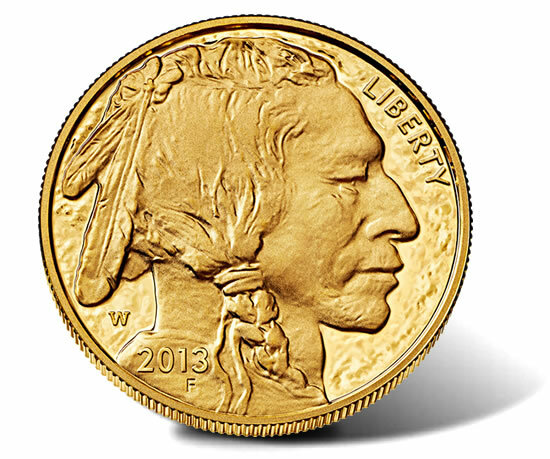 Reprised for modern use, obverses or head sides of the gold piece feature a portrait of a Native American believed to be based on three different American Indians. Reverses or tails sides depict an American Buffalo, or bison, likely modeled after Black Diamond of the Central Park Zoo. Surrounding obverse inscriptions include ‘LIBERTY,’ ‘2013,’ the initial ‘F’ for James Earle Fraser, and the ‘W’ mint mark denoting the proof coin’s production at the West Point Mint. Reverse inscriptions read ‘UNITED STATES OF AMERICA,’ ‘E PLURIBUS UNUM,’ ‘IN GOD WE TRUST,’ its legal tender face value of ‘$50’ and the weight and fineness ‘1 OZ. .9999 FINE GOLD.’ These coins have a reeded edge so there are no edge letterings. 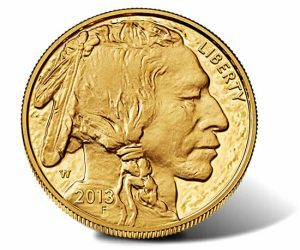 American Gold Buffalo coins have a diameter of 1.287 inches, a thickness of 0.116 inches, and weight of 1.000 troy ounces. Their weight and purity assures that every coin has a melt value equal to the current price of an ounce of gold. On release day, the London Fix for gold ended at $1,380.50 an ounce. That places the coin’s premium above melt at a higher than normal $409.50, which again highlights how missing out on the lower price could pressure early sales. On the flip side, the proof coin debuts at a price point that hasn’t been seen since 2011. 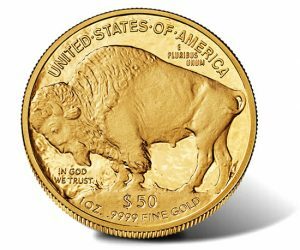 In a typical release year, there are two different types of American Buffalo Gold Coins — a bullion version intended for investors and the standard proof version for coin collectors. Since this year is not typical as it’s the centennial of Frazer’s design, the U.S. Mint will offer a special reverse proof later in the year. This is yet another factor that could affect overall sales, as the two coins will compete for a limited amount of collector money. A CoinNews.net article published on Wednesday offers side-by-side photos of the proof and upcoming reverse proof. Orders for the 2013-W $50 Proof American Gold Buffalo may be placed on the United States Mint product page for the coin, located here, or by calling 1-800-USA-MINT (872-6468). These coins are produced to meet collector demand, meaning there are no stated mintage limits. There are also no household ordering limits. Coins ship in a hardwood box with a matte finish and faux leather inset. They are accompanied by a Certificate of Authenticity. Below is a table of prior mintages and sales for the proof coin. Year 2011 and 2012 are unaudited sales totals. Poggie – seriously, I gotta ask – who do you know that buys these to melt them? What collector in his or her right mind buys a gold coin to send it in to be melted and wouldn’t look for another collector to buy it? Man I wish bullion collectors would find a hobby that makes sense to them – because obviously looking at mint coins isn’t it. These coins are not purchased only for their metal value (which now changes weekly with the pricing grid). Design, beauty, historical significance, demand and metal value all play into pricing. The US bullion coins were originally set up to be able to be easily purchased by retirement funds such as 401k & 403b. However, the majority of purchasers are individual collectors and investors. The grading of US bullion coins made value based on gold content non-existent. It you want to do that select the Canadian Gold Leaf 1 oz coin. It follows the melt price of Gold much more closely. For folks interested in purchasing the 2013-w .9999 gold proof buffalo, Possibly today will be the $50 cut to $1740.00. We shall see. If your coin has “COPY” on it then that is what it is, a copy of the real 2012 Gold Buffalo. You probably did not get yours from the U.S. Mint because they do not sell copies. I’m assuming you got it from a TV commercial. Those are clad that are 24-karat layered. In other words it is only a very thin layer of .9999 gold on the outside of the “coin”. It is worth near to nothing. NEVER BUY ANY COINS FROM ANY TV PROGRAM OR COMMERCIAL! And if you want “real” coins don’t buy anything that has “COPY” on it.